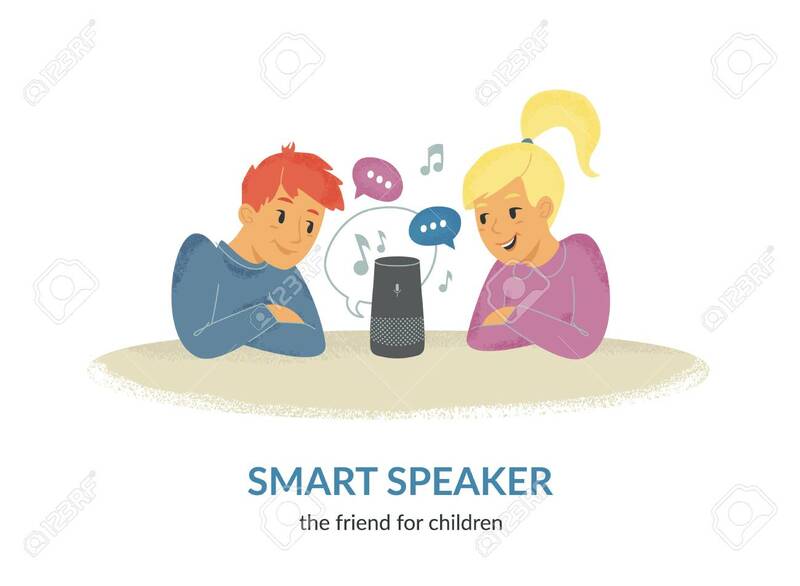 Smart Speaker Is The Friend For Children. Flat Vector Illustration Of Two Cute Children Sitting Together At The Table And Talking With Voice Command Device. Young Happy Friends And Virtual Assistant. Lizenzfrei Nutzbare Vektorgrafiken, Clip Arts, Illustrationen. Image 111636411. Standard-Bild - Smart speaker is the friend for children. Flat vector illustration of two cute children sitting together at the table and talking with voice command device. Young happy friends and virtual assistant. Smart speaker is the friend for children. Flat vector illustration of two cute children sitting together at the table and talking with voice command device. Young happy friends and virtual assistant.